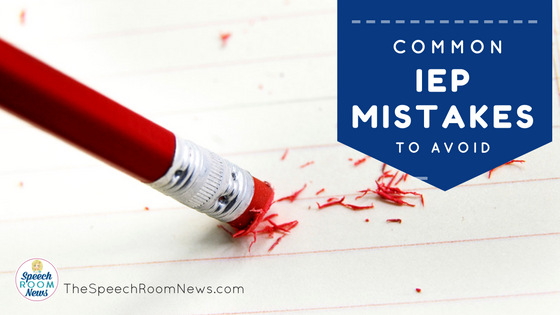 Are you making some of the most common IEP mistakes? Almost every district professional development meeting I’ve been to in the last few years has focused on what to write in the IEP. If you’re just starting out in a school job, what they don’t tell you is what NOT to write in an IEP. And what not to write, is just as important as what you should write! I’m so excited to focus on energy in 2016-2017 on creating content for people who are new the school SLP position. I’m doing that here on the blog and in my Facebook live video posts. If you’re enjoying posts like these, and are new to a school job, you can learn even more through an online video course. SLPs starting their Clinical Fellowship can enroll in CF 101 where I’ll help you get started with your school CFY with videos, paperwork, and practical strategies to have a successful CF. If you’re an experienced clinician who is switching to a school job, check out School SLP 101. You can earn .3 CEUs while you watch 70+ online videos that will help you navigate a new position. The biggest mistake I see in IEPs is when professionals list very specific programs or devices, rather than describing the systems or device. The IEP should have a description of the device and not a specific program named. This most often seen for SLPs in the area of assistive technology. Here, I listed the app and name of the tablet as the program. I listed a description instead of the actual app name. I also included the focus on those AT services and not just the device! The second problem I frequently see in IEPs is the over-use of accommodations. Accommodations listed in the IEP should be accommodations that are actually needed. I often see every accommodation available listed but we should be more specific about what the student actually needs. You can ask the classroom teacher and anyone else who works with the student which things they regularly do. You might also add a few things you plan to implement this year. Just don’t copy/paste your whole list of accommodations. Provide alternative books with similar concepts, but at an easier reading level. • Provide audiotapes of textbooks and have the student follow the text while listening. • Provide summaries of chapters. • Provide interesting reading material at or slightly above the student’s comfortable reading level. • Use peer readers. • Use marker to highlight important textbook sections. • Use word-for-word sentence fill-ins. • Provide two sets of textbooks, one for home and one for school. • Use index cards to record major themes. • Provide the student with a list of discussion questions before reading the material. • Give page numbers to help the student find answers. • Provide books and other written materials in alternative formats such as Braille or large print. That’s just the list for books! You shouldn’t have 50 accommodations listed. List only the ones student really need and teachers will actually implement because you want to reflect what the student actually needs. 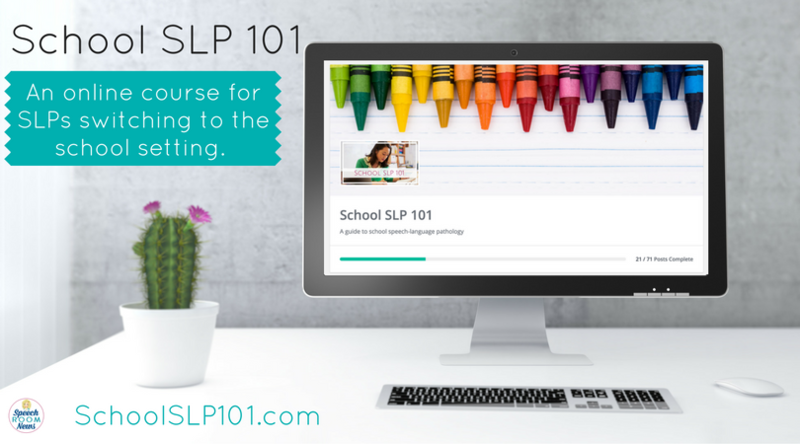 If you’re new to a school setting and looking for more essential tips to have a successful year, visit SchoolSLP101.com and learn more about the School SLP 101 course. Enrollment will only be open until August 31, 2016. Grab your seat before the school year starts! What other common mistakes do you see made in IEPs regularly? Leave me a comment or reach out on social media and let me know! « Why you should use speech therapy learning targets. Excellent article! 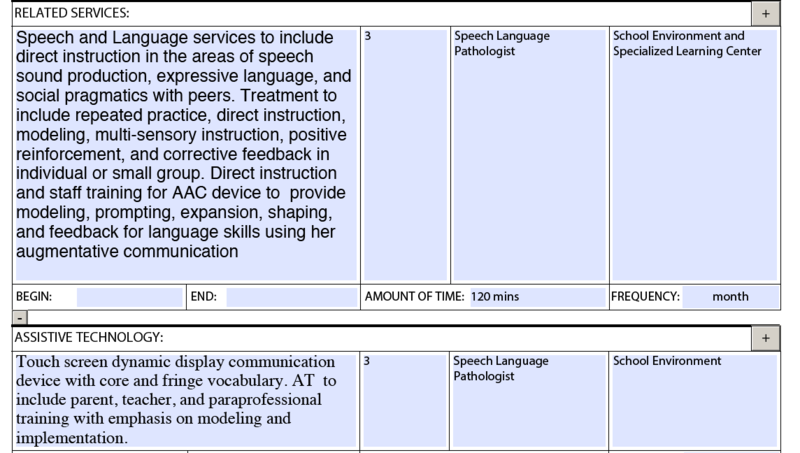 And this is from an SLP with over 30 years of experience. You provided very specific instruction on the type of language to use/not use on an IEP. In my experience, this type of instruction is not provided to new SLPs, yet they are expected to just “know” how to do this. More experienced colleagues are usually happy to mentor new SLPs, but time constraints, location differences, and overall workload can make this very difficult. Hope it’s ok that I shared it on Facebook. i attempted to go to the slp101 website, however it gives an error message that the site cannot provide a secure connection. it does not allow me to access the website. Oh no! the CF or the school one? Thank you for sharing this! It can be tempting as a school SLP (especially in the beginning) to want to write as many accommodations as possible. It is SO important to think about your local school culture, the norms in terms of teacher practice, and the needs of the particular students in your groups. Speaks to the collaboration that we do every single day…Very valuable info for a CF! Great resource to remain current for today’s workplace. Thank you for new ideas and creativity using ethical educational speech language pathology practice. Great article! My biggest mistake (?) maybe writing a goal that needs to be met in the general education classroom and there is not support person in the room to work on the goal nor to progress monitor. My general ed teachers just ignored emails, data collection sheets, and face to face requests. For example, I may have a kid that met his goal for asking for help in the resource setting, but the next step is for him to ask for help in his general ed class. Sadly, I could not get the teachers to monitor his goal. I would love to know thoughts from others. Do you write goals to help with carryover outside of the resource setting? I try to because using their skills in the general classroom is what we want them to do! Sometimes I put “input from classroom teacher” for the source of the data. Then I usually have to ask them face to face to get their input and they usually estimate the level of accuracy. Not super scientific but at least we’re getting some feedback on how the child is doing with carryover. I sometimes also put “input from parents” (usually for artic carryover) and attempt to send a note home or call once a quarter for some feedback. Then, with either one, you have the option of writing “teacher/parent did not provide feedback” and try to nicely say that you did your best but the other people aren’t helping that much. Consulting on doing this before writing it in the IEP helps, too, so the teacher/parent knows the purpose of the carryover goal and is willing to at least discuss it every so often and pay attention to whether the child is improving. I know teachers have too much going on in their classroom for taking data but even an overall impression every 9 weeks helps. Working in the school setting for 30 years, and witnessing TONS of IEPs, one of the things I witness is SLPs writing what I consider too many goals. You can’t fix everything in one year. Choose the skills that will give the biggest bang for your buck and record in present levels the strengths and weaknesses and what will be worked on in the future. That’s very true Stefanie! Do you have a ‘go-to’ # of goals/objectives? Excellent point! After 23 years I’m finally prioritizing! I typically write 3 goals. An expressive, receptive and a pragmatic goal. I don’t have phonology as a goal in my work setting.